There are many resources, schemes and ideas available to help you travel around the city in a sustainable way - helping you save money, burn calories and improve the city’s environment. Journey On gives you real time bus and train information. Traveline Southeast - plan a door-to-door journey to / from anywhere outside of the city, using any combination of buses, coaches, trains and walking. Metrobus - provides local travel between the A23 at Patcham and the city centre. Compass Travel - Runs a local bus route under contract to the city council. Add a PlusBus ticket to your rail journey and receive discounted Brighton & Hove bus travel for the day. 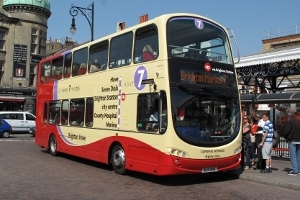 View the details and limitations on the Brighton & Hove Buses page. Walking and cycling around the city, using our extensive network of footpaths and cycle routes, can be the quickest and easiest way to get around. For more information go to our walking and cycling pages and view our city-wide cycle map [PDF 1.3mb]. A park & ride scheme is available from the Withdean Sports Complex. The route, which is bus number 27, runs from Withdean, through the town centre to Rottingdean and Saltdean. Find out more about it on our Withdean park & ride page. Car clubs are a form of car share scheme and offer another alternative to owning a car in the city. They are perfect for those who have occasional need for a car or van. There is one car club in Brighton & Hove called City Car Club. The City Car Club website provides more information on where car club vehicles are and how much the scheme cost. Have you thought about renting a car from a local resident or renting your car to other local residents when you're not using it? EasyCar Club is a national peer-to-peer car rental company now available to car owners and renters in Brighton & Hove. We currently have eight electric vehicle charging points at four locations across the city – Withdean, The Level, Bartholomew Square and Madeira Drive. View a map of the charging points and find out more about how the scheme works on our electric vehicle charging points page. You can get a 50% discount on a resident parking permit if you have a low emissions vehicle. Low emission is defined as a vehicle (not a diesel vehicle) that produces 110g/km or less CO2 emissions. This needs to be verified by the production of the V5C. Vehicles that qualify include certain models of Fiat 500, VW Polo, Vauxhall Corsa, Audi A1, Ford Fiesta and many more including most hybrid or electric vehicles. For more information go to the parking permit page. Journey On has a school section which can help you plan and route a quick and safe journey to school. Walking to school has many advantages including health, social and environmental benefits. The council supports the Walk to School Campaign and has two events promoting this every year. For more information on walking to school and various schemes around it, including Park & Stride, go to our walking to school page. We also encourage cycling and scooting to school and offer free training around this. 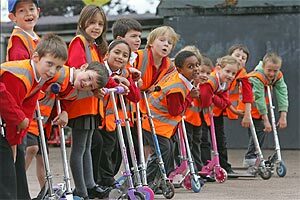 For more information see our cycling and scooting to school page. For more information around travelling to school and using public transport for school travel go to our school travel page. All of this means that as a city we have an above average rate for primary school children walking to school. The council has won over £4m to improve one of Brighton’s busiest roads and cut congestion. Lewes Road is also amongst the worst areas for air quality in the city and the fund will help towards tackling this as well as making it easier and safer for those using this route. 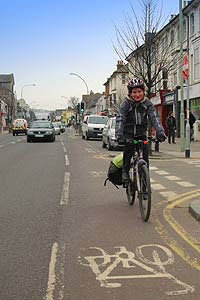 For more information and to see how you can get involved go to our Lewes Road transport improvements page. By travelling around the city in healthy and sustainable ways you help towards reducing congestion and improving the city's air quality and health.